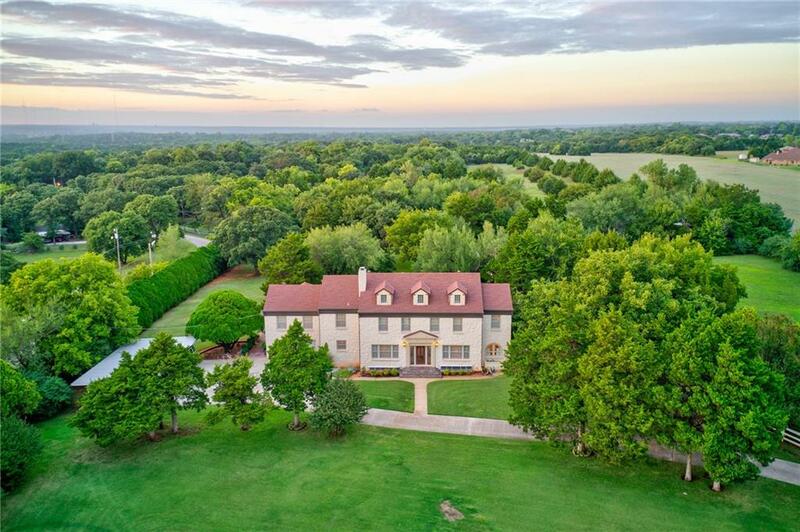 Private Gated Historical Estate situated on 10 acres near Twin Hills Country Club. Manicured expansive lawns provide the perfect setting for this classic home. With three living areas, sun room, wet bar, two dining rooms, five bedrooms (two masters), three full bathrooms, and two half baths the possibilities for this home are almost limitless. Numerous features include an elevator, cedar closet, sewing room, in ground storm shelter and spectacular millwork in the formal living and dining rooms. The spacious brick patio opens to the wooded back yard which boasts an unfinished guest house (not included in listed footage) with a kitchen, bedroom, living area, bathroom and one car garage. In addition the property has a 30â€™x60â€™ enclosed shop, covered RV parking and separate 10â€™x30â€™ stone storage building. This very special property is a must see!